(CNN) -- Three years ago Elizabeth Smart was kidnapped from her suburban Salt Lake City bedroom and held captive for nine months. Brian Mitchell, a self-described "minister of the Lord," and his wife, Wanda Ilene Barzee, were charged in the girl's disappearance. 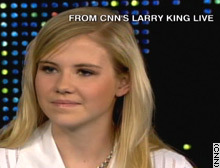 Thursday night, Smart spoke on CNN's "Larry King Live" in her first live interview since the abduction. She was joined by her father, Ed Smart, and John Walsh, host of TV's "America's Most Wanted." KING: Let's spend some moments with Elizabeth. How you doing? ELIZABETH SMART: I am doing great. KING: This had to be rough on you the whole situation. How do you feel being the center of attention? ELIZABETH SMART: It's different. I never expected it. KING: Don't like it? ... You helped pass this bill.... The bad that happened to you brought about good. ELIZABETH SMART: Yes. I just hope that no child or anybody would ever have to go through what I went through because nobody deserves to go through that. And it's just so -- it's horrible for people. ... Fortunately for me, ... I haven't been slowed down by anything. But other people sometimes it just drops their whole life around it, and they can't move on because it's so horrible to them. KING: During the nine months of this story were you aware of all the attention being paid to you? ELIZABETH SMART: I don't think I was aware as much. ... I didn't know so much. ... I always had faith in my family. Like I didn't think they'd give up on me, but I didn't know how big it was. KING: No? ... Do you think back often to the night you were taken? KING: Don't think about it much? KING: You're now, what? You're going to graduate high school? KING: Working in a bank? KING: Just I like to know where you are positioned in the bank. And you're going to go to Brigham Young University? KING: And you have a boyfriend? KING: ... You don't have to name him and he's going on a mission right? KING: Are you a devout Mormon? KING: How is your younger sister, Mary Catherine? We all got to know her well. ELIZABETH SMART: She's doing great. She is the cutest little girl ever. I just love her. KING: She was with you the night you were taken right? KING: When that happened was it all like a -- I don't want to put words in your mouth -- a dream? A nightmare? ELIZABETH SMART: Yes, it seemed very unreal. ... I couldn't believe it because my family has always been safe. My mom's always (saying), "Call me when you get to your friend's house. You know you need to be home by this time." You know we have always been ... a safe family, so I didn't know what was going on. KING: Did you ever think during this time, Elizabeth that you would be killed? ELIZABETH SMART: ... Yes I did. KING: When you were first taken? KING: After a while though did that not enter your thoughts? KING: The day you got free. What do you remember about that most? You were identified right on the street? ELIZABETH SMART: Yes. It was ... the greatest day ever just seeing my dad and my mom and my family. It was wonderful. KING: You never lost faith did you, Ed? We just know how bad it is, and we do not want to see other people have to go through it. And, Orrin Hatch has been so wonderful in pushing this along with John. John, his face is everywhere. KING: Knowing how strong your faith is, Elizabeth, do you forgive your abductors? ELIZABETH SMART: Yes. Yes, I do. ... One day my mom sat me down and she said, "You know, Elizabeth, you can either ... forgive them and move on and just forget that it ever happened to you and ... continue on in your life or ... (believe) what they did to you was horrible and you didn't deserve that and no one should deserve that and ... you can just sit there and be mad at them." But really then ... your whole life is going to be wrapped up in it and you won't be able to move on. And you'll ... always think to yourself, "Oh well, my life would be so much better if these two people never had happened" ... And just blame everything on them. KING: Fortunately, Ed, there will not be a trial right? ED SMART: I have no clue. KING: I thought that was the word. ED SMART: No, we are still waiting. The last comment was if Mitchell would cooperate he could be made competent, (so) how is he ever going to cooperate? KING: You don't want her to testify? ED SMART: No. ... I would just as soon see him locked away, whether it's a civil commitment or whatever. KING: The most extraordinary thing, Elizabeth, is coping. How did you cope? KING: No, through all those nine months. What kept you going during the day, at night, going to sleep? What kept you going? KING: So that was always present to you? ELIZABETH SMART: ... I always knew that He loved me and that whether I survived or I didn't He would always be there and that my family would always love me no matter what happened. KING: But didn't you ever say at all "Heavenly Father, why have you let this happen to me?" ELIZABETH SMART: Oh, absolutely but ... why someone else? ... I asked myself the same question. ... If it wasn't me, who would it be? And ... I'm happy to say that ... I am here today and I am doing great. ELIZABETH SMART: And I want this bill to go through so that so many more people will be protected, young children, girls.... Nobody should have to go through that. KING: You were very emotional looking at the clips we showed going to the last break of your father and your mother the day you went missing and then talking. That still hits you, right? To know how loved you were and are? KING: Is it hard to look at? ELIZABETH SMART: ... I'm touched to see how much my parents love and care for me. But ... I don't try to think back. I don't try to look back. I .. see my life before and then now and ... I don't sit there and think about it. I just go on. ELIZABETH SMART: ... I have a lot of people come up to me and they'll (say) "Oh, you look so familiar. Where do I know you?" ... Sometimes they'll start to cry and they'll (say) "We prayed for you." And I appreciate it so much. ... I am still amazed at how much people did for me. ... Every day I have people come up to me (who say), "We just want you to know that we prayed for you." And I appreciate it so much. KING: How are you treated in high school? KING: Just like another kid? You can't be treated just like another kid. ELIZABETH SMART: I'd walk down the hall sometime and there are some kids that would like yell my name just to see if I'd turn my head or if it was really me. KING: But other than that it's a normal day? KING: (Does) your boyfriend ask you a lot about it? KING: Elizabeth, are you super careful about strangers, about your environment, about who's around you? ELIZABETH SMART: I would say I'm very cautious about where I go and people who I associate with. KING: Do you tend not to go places alone? ELIZABETH SMART: I know my parents prefer me not to. ELIZABETH SMART: ... I don't really go places alone. .. It's not because I'm ... scared or worried or anything. ... It's just funner (sic) when there's another person with you. KING: How careful are you, Ed? ED SMART: About my kids? KING: You no longer hire drifters? ED SMART: No, we no longer hire homeless people and ... after something like this we're paranoid, aren't we? KING: You're not too happy about that. The truth? ELIZABETH SMART: Well, I know they care about me, and I appreciate it. But there are times definitely when (I think), "just move on already." KING: Well, it's understandable though, right? KING: How paranoid are you?... Don't go out. ED SMART: No, I want her to go out. I want her to live. I want her to be careful. ... Things are different than they were with us growing up, and there is just no question that it is riskier. And I just want Elizabeth to realize those risks and the potential consequences out there. KING: Because she would be a likely target, wouldn't she? ED SMART: Sure. Sure she would be. KING: If you're going to grab someone, grab a name. KING: Are you concerned that you live in Salt Lake and she's going to Provo and she's going to go to BYU? She will be away from home. ED SMART: She will, but I feel really comfortable .... She has weathered the storm, and I know that she'll be able to handle it. ... We're going to be concerned, but she'll probably hear from dad, "How are you?" KING: How do you feel about going to college? ELIZABETH SMART: ... I'm excited. But I remember thinking everyone was so old when they're (saying), "Oh, yes, I'm going to college this year." And now (I'm thinking) "I'm not that old." KING: Are you going to major in music? KING: Do you want to play harp for a living? KING: You'd like to be a professional harpist with a symphony orchestra? ELIZABETH SMART: Or a teacher, yes. KING: What got you into the harp? I grew up with 100 people. Not one said "Boy, I want to be a harpist." ELIZABETH SMART: I actually played the piano when I was little, but I didn't play it for very long. KING: Did someone say "Take the harp"? ELIZABETH SMART: I think my mom. I think she suggested it, and she showed it to me. And I saw ... little ornaments and had one on a Christmas tree and I (thought), "Oh, I want to be a little ornament. I want to play on the Christmas tree." KING: That's a great story. (Ed), how is your wife doing? ED SMART: She's doing great. The family is just doing very, very well, and we want to see all those other families do the same. KING: You lost your dad? ED SMART: He passed away a couple months ago. KING: He was at the house when we went up and taped the whole family. KING: Did you ever see any television during this period? Did you ever see ... this show, John Walsh, or people going on talking about you? ELIZABETH SMART: No. I saw a poster. I saw a couple posters. KING: Posters (that said) look for this girl? KING: Strange to be in that world. Did nine months seem longer than nine months? ELIZABETH SMART: Oh, yes. Yes, they seemed very long.